COLUMBUS, Ohio--(BUSINESS WIRE)--Root Insurance, the nation’s only car insurance company that operates entirely via mobile technology, has added availability in four new states since October. The company now offers insurance to nearly 30 million more drivers across Pennsylvania, Texas, Kentucky and Mississippi. Drivers in ten total states are eligible to download the Root app and save up to 52 percent on their premiums. Root Insurance sets rates based primarily on actual driving behavior, using variables that drivers control to give fair and accurate auto insurance rates. Since Root’s launch in Ohio, the insurtech startup has experienced continued growth, expanding to nine additional states, including Arizona, Indiana, Utah, Illinois, Oklahoma, Pennsylvania, Texas, Kentucky, and Mississippi. 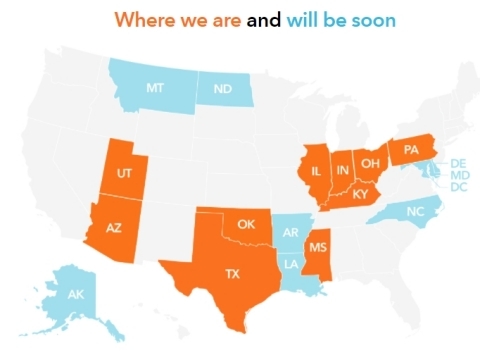 In the coming months, Root plans to roll out in at least four additional states (Louisiana, North Dakota, Arkansas, Maryland). Root is the nation’s first carrier to leverage mobile technology and data analysis to base rates primarily on how individuals drive. While most traditional insurers calculate rates by categorizing drivers into demographic risk pools, Root takes a more personalized approach by using mobile technology to accurately understand which drivers are least likely to be involved in road incidents. Root offers discounts for safe driving behavior and was also the first company to provide a discount for drivers using cars with automated driving features. To join Root, customers download Root’s iOS or Android app and drive for two to three weeks. Their driving behavior is then analyzed through a proprietary rating engine, which measures activity, such as acceleration, braking, turns and mileage. This process enables Root to understand the individual risk of each driver. Good drivers then receive their quote and manage their policy entirely through Root’s smartphone app. Root is available today to drivers in Ohio, Arizona, Illinois, Utah, Oklahoma, Indiana, Pennsylvania, Texas, Kentucky and Mississippi and will continue nationwide expansion in 2018. To enroll, download the app onto your iPhone or Android today and start driving. Root Insurance is the nation’s first licensed insurance carrier powered entirely by mobile and founded on the principle of fundamental fairness. We offer personalized car insurance that gives good drivers the rates they deserve, managed seamlessly through a mobile app. At Root, we use smartphone technology and data science to understand actual driving behavior, the primary factor in determining our auto insurance rates. Root is headquartered in Columbus, Ohio and backed by the largest reinsurance company in the world. Currently, Root is available to drivers in Ohio, Illinois, Indiana, Arizona, Utah, Oklahoma, Pennsylvania, Texas, Louisiana and Kentucky, and will be coming to more states soon. For more information, visit @joinroot, http://www.joinroot.com, and get the rate you deserve by downloading the app.